Did you know that after a presentaion, 5% of people will remember the statistics while 63% will remember the story? We are constantly being bombarded with information. Social media, whitepapers, blogs, webinars, apps, news - it is information overload. Storytelling is an effective way to cut through some of this clutter and rise to the top. Never underestimate the power of a good story; it has the ability to evoke a personal and emotional connection between the audience and a brand. And as more brands make the move towards content marketing, connecting with your audience through compelling stories is more important than ever. Check out these infographics on storytelling and maybe learn a thing or two! Believe it or not, storytelling can increase revenue. It puts the audience at ease with the brand and engages them with the human side. Companies can utilize stories to dramatize and embellish their company message to make it exciting. The best part is that it is not a dry data dump that overwhelms your audience. The key to good storytelling is to ensure that your audience does not feel sold, but instead feels led down a path that allows them to make the right decision. 92% of consumers want brands to made ads that feel like a story. As a result, you should deliver content that is linear and expresses a clear narrative. Humans process images 60x faster than words. Therefore you should show, not tell. Use images for more compelling content. When processing facts, two areas of the brain are activated. A well-told story can engage many additional areas, including the motor cortex, sensory cortex and frontal cortex. Press releases that contain multimedia get 77% more responses as opposed to text-only releases. Furthermore, blog posts with videos are linked to 3x more than text-only posts. No one reads anymore. 79% of people scan the web rather than reading word for word. To counteract this, make sure your message doesn't get skimmed. Frame it as a story with a captivating opening to hook readers. Lastly, marketing is noisy. It is estimated that people see up to 5,000 marketing messages per day. The solution is simple - your story, told by you. Numbers don't lie - a brand's best story is told online within the frames of photos and videos. In fact, videos are shared online 12 times more than links and text posts combined. Still not convinced? Facebook reached 100 million users in 4 years, but Instagram is on pace to beat it. A lot has changed since this time. We are becoming obsessed with sharing our photos online, and brands are starting to take notice. In March of 2012, Facebook rolled out the "timeline", placing a larger emphasis on storytelling through photos and videos. #5: Visual Storytelling by VFM Leonardo Inc.
Once again, videos are being shared 12 times more than links and text posts combined on Facebook. 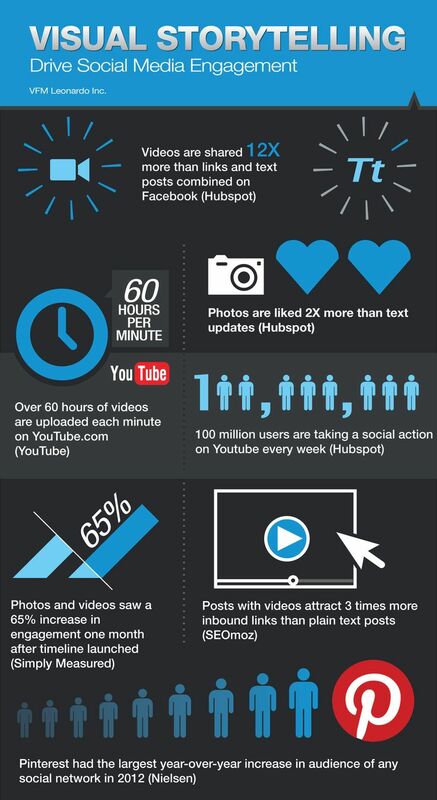 Additionally, photos are liked 2 times more than text updates (via Hubspot). Over 60 hours of videos are uploaded each minute onto YouTube. Posts with videos attract 3 times more inbound links than plain text posts. Lastly, Pinterest experienced the largest year-over-year increase in audience of any social network ever.